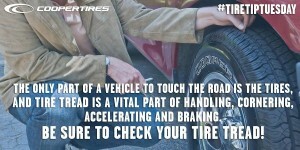 Had those tires inspected lately? Uneven tread wear –This can include more wear on one tread edge than the other, a rippled pattern of high and low wear, or exposed steel wire. Uneven wear can be caused by problems such as under inflation, vehicle misalignment and improper balancing. Shallow tread –Well worn or bald tires can result in hydroplaning, loss of traction and are more likely to be damaged by potholes and other road hazards. 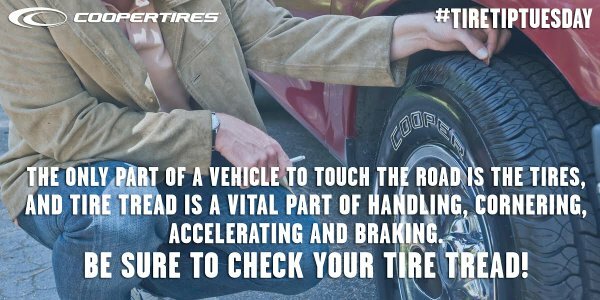 Replace tires when worn to 2/32 inch (1.6 mm) tread depth anywhere on the tread face. To help you see when the tread is worn out, tires have a built in “tread wear indicators.” These are narrow bars of smooth rubber that run across the tread. When the tread is even with the bars, a tire is worn down to 2/32 inch and the tire must be replaced immediately. You can also try the penny test: place a penny in the tire’s most worn groove with Lincoln’s head facing down. If you can see the top of Lincoln’s head, the tire should be replaced. Troublemakers –Check for small stones, pieces of glass, bits of metal and other foreign objects that might be wedged into the tread and carefully remove them. They can cause serious problems if they are pushed farther into your tire as you drive. Damaged areas –Cracks, cuts, splits, punctures, holes and bulges in the tread or on the sidewalls of the tire can indicate serious problems, and the tire may need to be replaced. Slow leaks –Remember that tires lose inflation pressure when the air temperature gets colder (about 1 psi for every 10°F drop in temperature). Tires may also lose a certain amount of inflation pressure due to their permeability (about 2 psi per month). However, if you find that you have to add inflation pressure every few days, have the tire, wheel and valve checked by a tire service professional – and if necessary, repair or replace the tire. Valve caps –Those little caps on your tire’s valve stem keep moisture and dirt out, so make sure they are on all your tires. Also, when you have a tire replaced, have a new valve stem assembly installed at the same time. For all tire and service needs, see our Certified Technicians at Wetzel Auto! To schedule your service appointment, give us a call at (765)966-7000! 0 comment(s) so far on Had those tires inspected lately?